This little tour begins from the traffic circle at the intersection of SW Montgomery St. and River Dr, by the sign to South Waterfront Park and Garden. It has you walking north along the esplanade in front of the shops and restaurants. It concludes about 900′ to the north at the Riverplace Hotel. 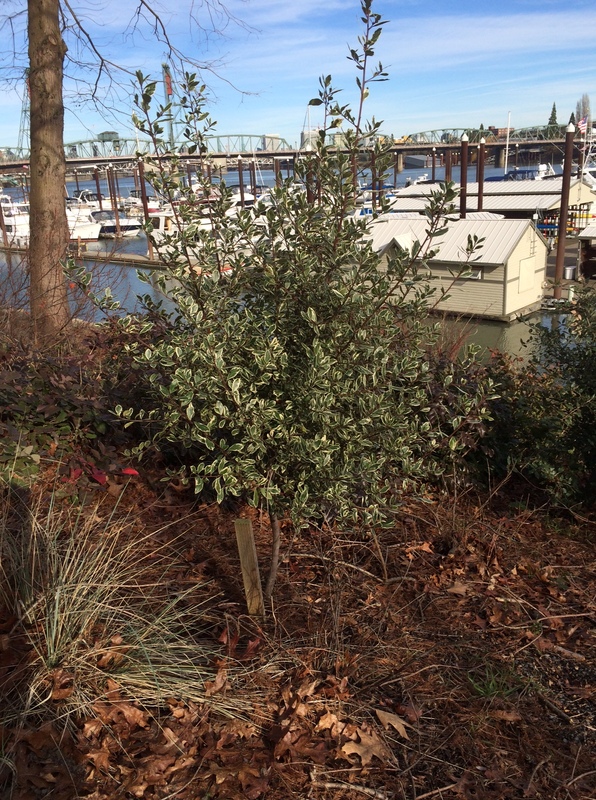 This entry was posted in Horticulture, Landscapes, Mediterranean/ Maritime NW, Parks, Plant Choice, West Coasties, Xeric and tagged Arbutus arizonica, Arbutus menziesii, Arctostaphylos bakeri 'Louis Edmonds', Arctostaphylos pajaroensis 'Warren Roberts', Arctostaphylos viscida 'Sweet Adinah', Arctostaphylos x 'Austin Griffiths', Arctostaphylos x 'Harmony', Ceanothus cuneatus, Ceanothus gloriosus 'Emily Brown', Ceanothus thyrsiflorus 'Umpqua Sky', Cistus platysepalus, Cistus pulverulentus 'Sunset', Cistus Snow Fire, Cistus x 'Blanche', Cistus x dansereaui 'Jenkyn Place', Quercus chrysolepis, Quercus wislizenii, Rhamnus alaternus 'Variegatus' on January 31, 2015 by gardenriots.